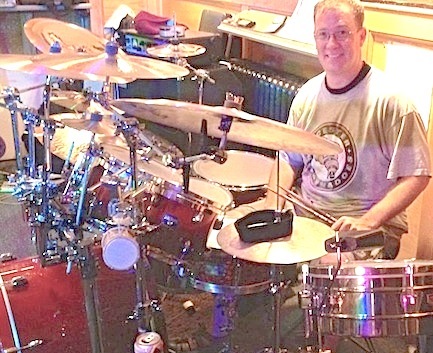 Tim Kane teaches most beginner to advanced musical styles on drum set and snare, including hard rock with optional double kick drum, jazz, funk, reggae, world beats and marching drum corps. 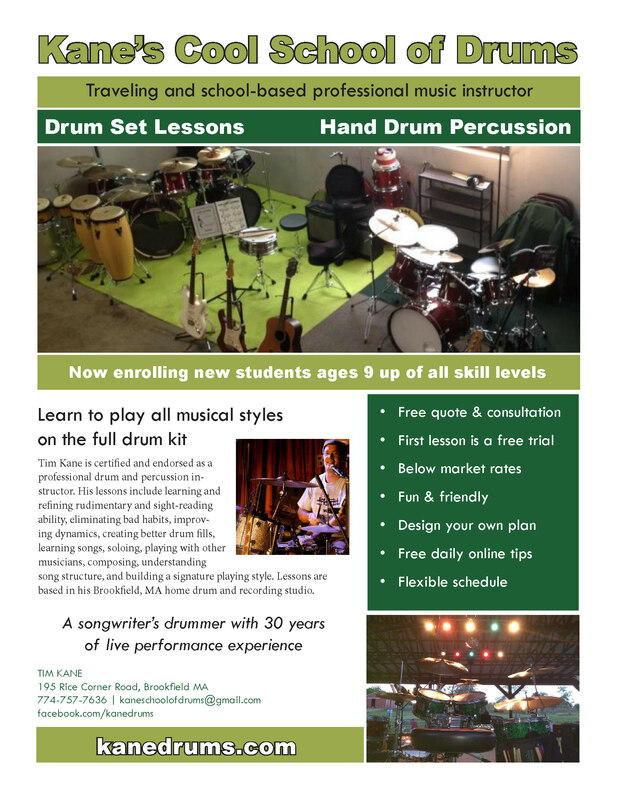 Lessons include learning and refining students’ rudimentary and sight reading ability, eliminating bad habits, improving dynamics, creating better drum fills, soloing, playing with other musicians, composing original parts, understanding the mechanics of song structure, and building a personal signature playing style. Ear training is enhanced with drum play-along songs. Kane records every session so students and parents can review progress. Lessons can be offered at his Hardwick school studio, at his home-based music studio in Brookfield, Mass., and in students’ nearby homes. Kane offers a free one-week trial before students commit to regular lessons. Lessons generally cost between $35-50 depending upon length and location. 1 – Develop your rudimentary hand-foot technique from beginner through advanced. 2- Learn to sight-read and/or improve your ability to do so live. 3 -Enhance your listening skills with a play-along track program, and learn songs you choose and find challenging. 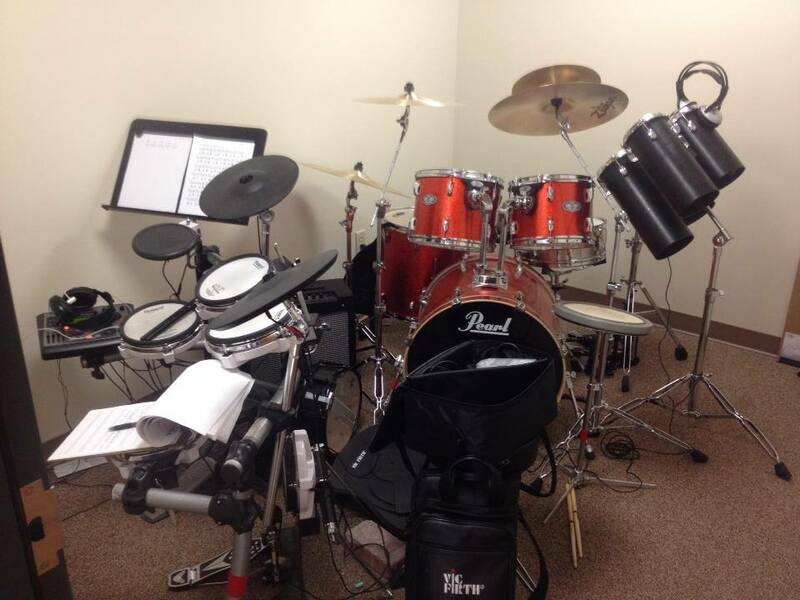 4 -Learn to compose and play drum solos, which we’ll record for you as pro MP3 files. 5 -Work on school-based band sheet music and songs you need to learn. 6 -Refine your playing style, whether it’s double bass oriented or traditional hi-hat. 7 -Improve your endurance and sense of dynamics. 8 -Play better and more intricate drum fills and a variety of musical styles from jazz and funk to rock and metal. 9 – Benefit from decades of wisdom from playing with other musicians, and a growing collection of instructional videos and audio recordings. 10 – Set goals and achieve them by having a professionally trained instructor guiding you along the way.